I mentioned yesterday that we had another surprise for the group. 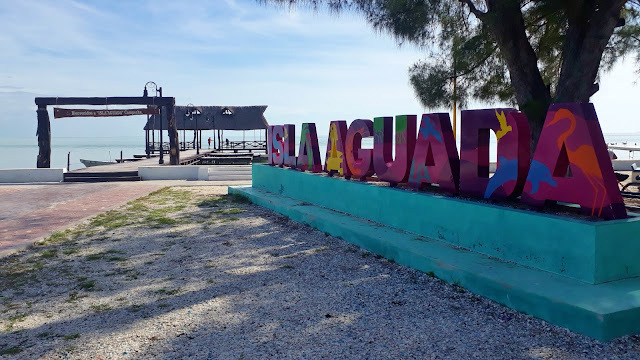 Our original schedule had us spending three nights here at Isla Aguada and then today moving on to the city of Campeche for three nights. We have a city tour of Campeche booked for 3pm on Saturday. But the RV parking in Campeche is at a balneario (swimming resort) in an open field with minimal services. The weather here at Isla Aguada has been great and people are just enjoying relaxing. So I asked Gabriel, the owner of Caravans de Mexico if we could make an adjustment to do four nights here and then two nights in Campeche. 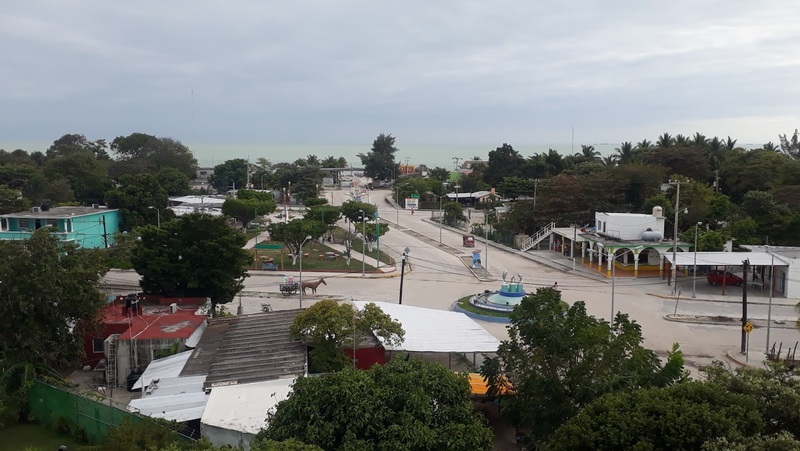 If we left here at a decent hour on Saturday morning, we would still arrive in Campeche with lots of time to do the city tour starting at 3pm. Gabriel agreed that was fine, and so we surprised the group with one more night at this location. Everybody loved the idea! Lots of pelicans around here! 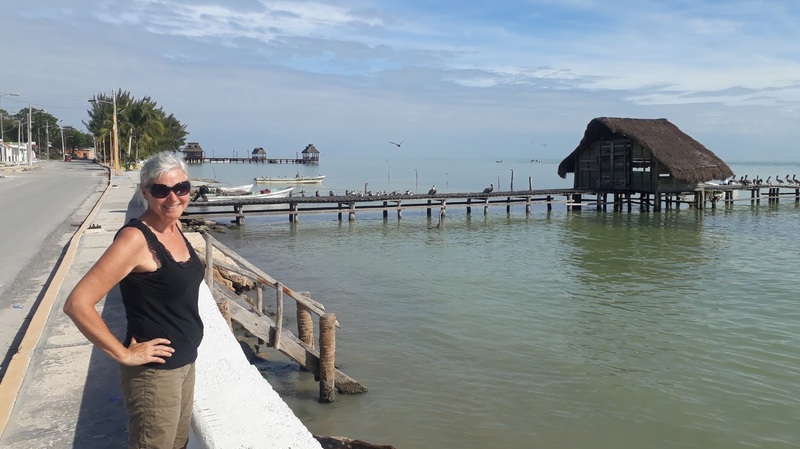 We puttered around for the morning, while 11 of the group members hired themselves a boat to take them out to see the dolphins and a birding island. They came back with great stories about the dolphins, and they enjoyed themselves so much that some of them are going again this morning! After lunch, we were getting ready to take the bicycles for a ride. I was just finishing up reading some emails when I saw a flight deal notification come through. There's a new discount airline starting up in Canada. FlySwoop is owned by WestJet and begins operations in June. Yesterday was the first day of taking reservations and they had some fantastic deals. Very limited routing for now, but there was one that caught my eye. Abbotsford B.C to Hamilton, Ont. That's essentially Vancouver to Toronto, but using smaller local airports that have lower taxes and fees. We need to be in Hamilton for Sept 29 for Ruth's nephew's wedding! This could work well because we will be in British Columbia with the motorhome for the month of September. I found a flight that departs September 26th and returns Oct 17. It happened to be one of their 500 dirt cheap seats that they released as part of the opening day. The final total price was $43 CAD ($35 USD) per person return. Essentially, it was a zero fare, with paying only the taxes and fees. I tried booking it, and it even let me put in my credit card info, but every time I went to pay it said "I'm sorry, this flight is no longer available". Obviously a glitch because the system was overloaded. But I don't give up so easily. I called customer support where it said there was a $15 surcharge if you book over the phone. Of course the lines were busy, but I only had to wait ten minutes or so. I explained the problem to the guy, he went and checked with his supervisor, and they gave me a booking number for the deal price! It took me 45 minutes on the phone to get the deal, but it was worth every minute. Yep, $86 in total to fly the two of us from Abbostford to Hamilton and return. Sweet! Now, because it's a no frills discount airline, we are only allowed a very small carry on that has to fit under the seat in front of you. But this is normally a $400 per person flight, so we will make it work! Now, just have to keep my eyes open for a cheap car rental and we'll drive up to Ottawa after the wedding. With that done, we took off on the bikes to do some exploring. 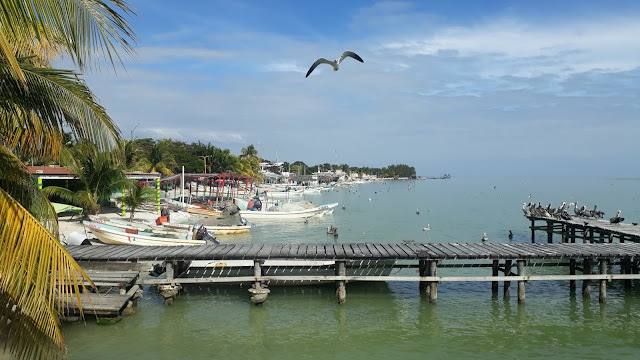 Isla Aguada is a sleepy little fishing village. It seems almost everyone here is in the fishing business. We spoke to the fisherman here. He said the name of the fish, but we don't remember it. He told us that they dry this fish in the sun, and then it is shipped to San Cristobal de las Casas and Tuxtla Gutierrez in Chiapas where it is sold. 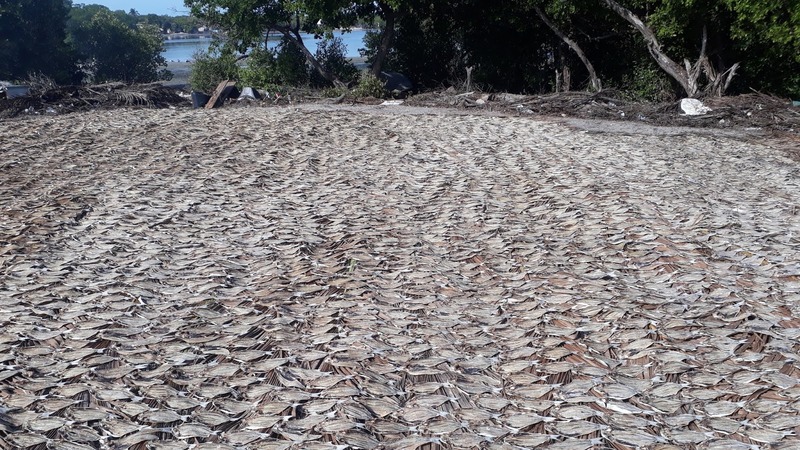 Fish, drying in the sun. When the sun is shining, he says it only takes one day to dry. Isla Aguada has a history with the pirates. 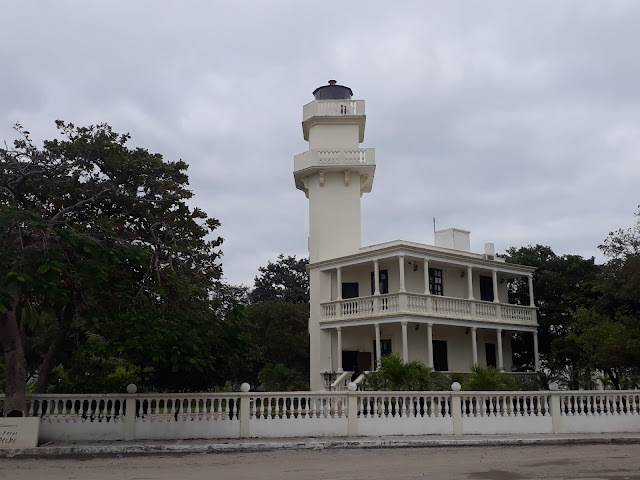 The original lighthouse was recently restored and now has a museum. We were walking with our bikes through the park beside the museum when a young man in some kind of port authority uniform came up to us with a smile. He said the lighthouse houses a museum, and would we please visit? I told him we didn't have any money with us (we really didn't! ), but he said that's okay, it's free! Jose Armando brought us into the old lighthouse and asked us to sign the guestbook. It was 3:45pm, and we were the first visitors of the day! He proceeded to give us an enthusiastic guided tour, of course all in Spanish. Although we miss bits and pieces, we are definitely better than we have ever been and we can ask questions when we don't understand. He said that if we brought some of the group over today, they would have another guy who speaks English available. 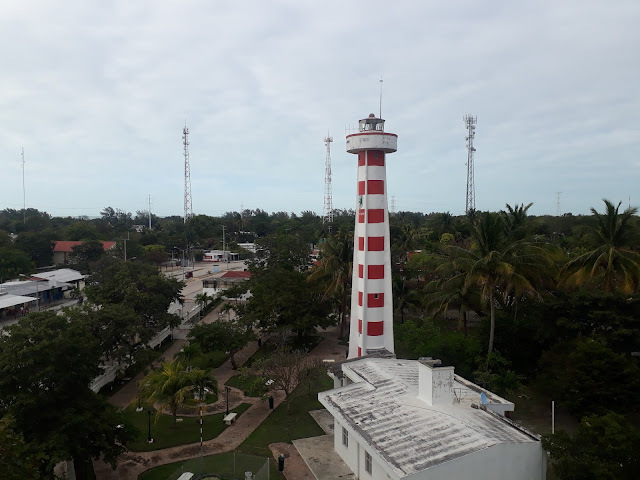 View from the top of the old lighthouse. Especially when the flights are in Canada! What a great deal on that flight. And the tour would have been fun as well. Everybody loved the boat tour and seeing the dolphins. We will have to do it next year. We'll see. Enjoy your day. I hope that you were/are able to get a great deal too! There's a reason why those plane tickets are "dirt" cheap---they need testers for the engines and wings ;) Amazing deal! Wow you sure know how to get the deals for flights. Hope all goes well. Enjoy. Also nice that you can stay an extra night at this beautiful beach. Yep, Kevin sure seems to find some good deals that is for sure. The extra day here at the beach with beautiful weather is just want the group needed. The sunshine has sure changed everyone's mood, not that they were unhappy, just feeling a little low and waterlogged. Maybe in time they will add more destinations but for now it is at least a start for Canada to have some decent priced flights. We figure that we can fly nice and cheap with minimal baggage and just buy what we need at a thrift shop. We really don't need much anyways! 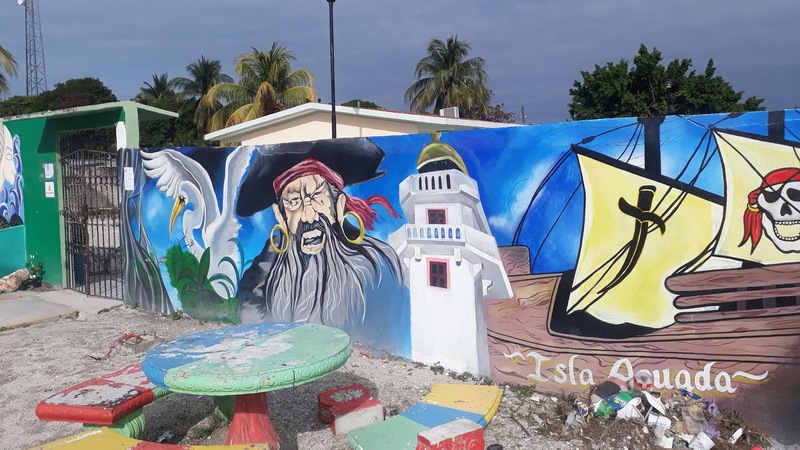 Here is the story of the Pirates of Isla Aguada as told to me by Bill, the deceased owner of Freedom Shores. Back in the days of pirates, this laguna was used as a refuge for the pirates. After they plundered Campeche or Champoton, they would make a run down the coast to Isla Aguada where they would sail into the laguna with their shallow draught vessels, hotly pursued by the Spanish. The Spanish Galleons were too large to sail into the shallow laguna after them so the pirates could sit and thumb their noses at the Spanish while safe and sound in their refuge! Interesting story and we can see that happening. The fishing boats as well as the tour boats have to be careful where they go once they are this side of the bridge. There are definitely some hidden sandbars and shallow areas out there. An excellent deal with swoop! I hope the group will go for the light house tour... I'm surprised those fish drying in the open are not getting taken by the pelicans. Ed Peter, I had thought the same thing. Once the dried fish are shipped to another location, I wonder what they do with? 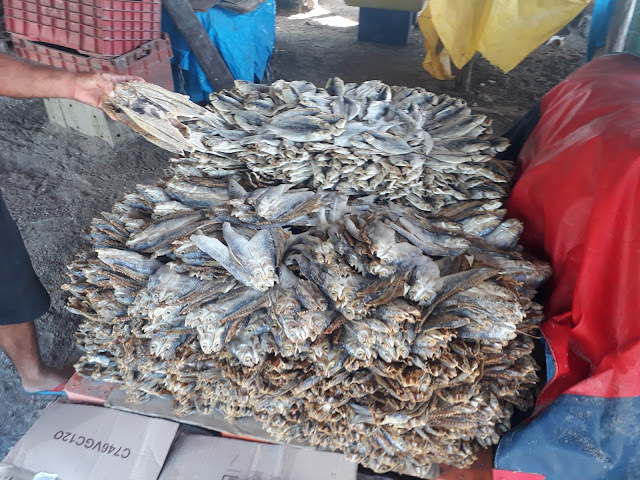 I know that some people use dried fish for organic fertilizer; I've also seen dried fish eaten with hot mustard in Norway and Denmark. 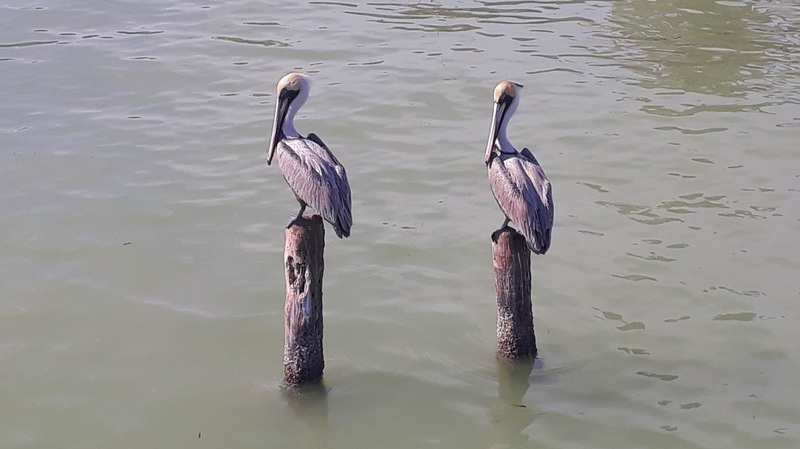 Strangely enough we didn't see any pelicans even trying to get the fish. I wonder if part of that is because they salt the fish when they dry them or because there is always someone nearby cleaning fish and then throwing the remains out into the water for them and the sea gulls. 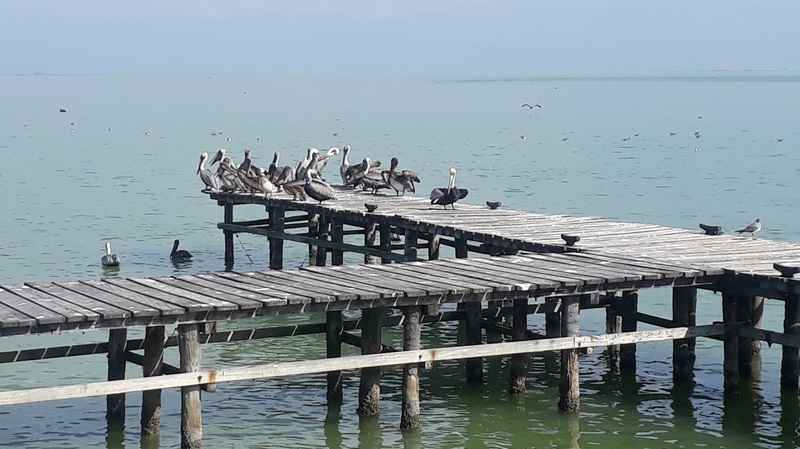 There is probably also someone watching over the drying fish ready to shoo the pelicans or other birds away. 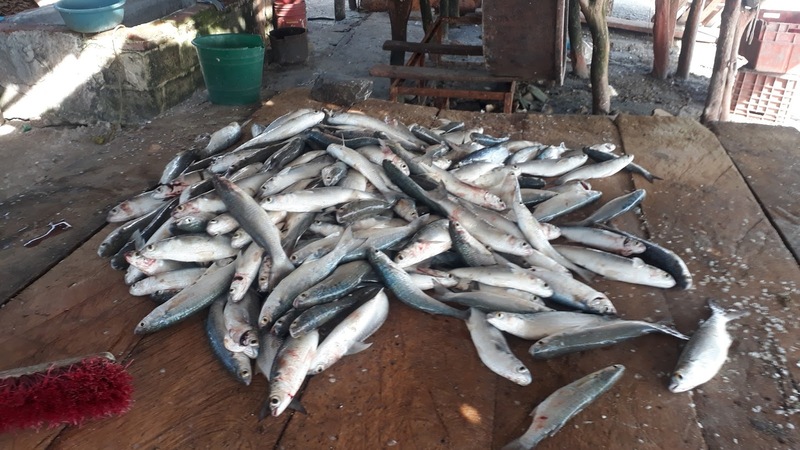 Dee, I am not sure what they use the fish for, it would definitely be a food source, just not sure how they prepare it, whether they eat it dried or if they use it for soups. Actually Kevin, your "surprise" bought up a good point re scheduling. It makes sense to schedule free days at the start of a location so it gives the freedom too add a day at the previous one, especially in a case like this where you've had the first sun in awhile. It is always nice to have the option that is for sure! Love that sweet little fishing village. Looks like a great area to explore. Kevin is great at finding deals but it also helps to be very flexible and many people aren't. We were also very lucky that the two airports were good for us! Wow, great deal flying from one end of the country to the other AND back! 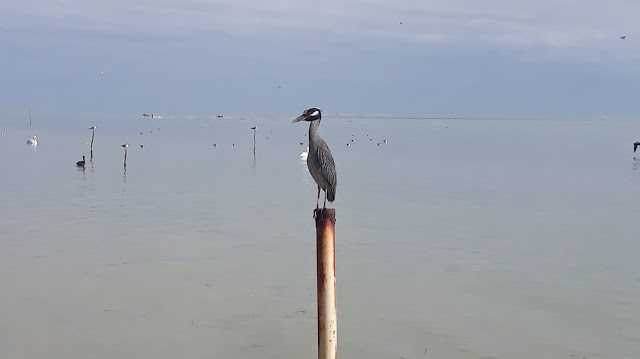 Thank you for the identification on the Yellow-crowned night heron. I was pretty sure it was a heron just not sure which one. Love, love, loved the sunset picture! I’ve never seen anything quite like that and I’ve seen quite a few beach sunset pictures in the past 7 years of traveling! Good shot! Thanks again for an interesting and informative blog Kevin and Ruth! You are excellent wagon masters! Safe travels! I am sure we will see many more sunsets and sunrises before this trip is over. Thank you for your lovely comment, we just love to tell people all about Mexico and our travels. Monday is a holiday here in Mexico. You might see an uptick in tourists at the balneario if the weather is warm. Wall to wall fish!!!!! Love all your photos! You gotta love free!! Love your spot on the beach. Definitely worth another day. It was a wonderful spot to spend an extra day, everyone loved it. Really cool how the fish are drying. What were they laying on? Palm fronds? It was interesting to see the process. Yes, the fish were drying on palm fronds.